It’s Friday, let’s have fun with beer kegs! 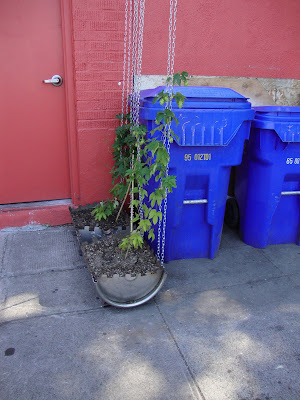 I spotted this inventive planter on a sidewalk just off Burnside Street here in Portland. It appears some creative type is creating a screen to hide the trash and recycling containers from the sidewalk seating for a nearby restaurant. 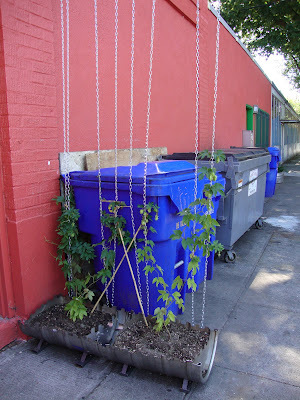 Continuing with the beer theme they’ve got Hops planted and being trained up the chains. Love it! I think the overall look would benefit from a little gravel topdressing though. Maybe I'll have to guerrilla-mulch some night soon. Hilarious! I love all your recent street garden posts. Just so cool to see the creativity out there, thriving along with the plants. Funny that they don't have a hidey hole for those mondo cans. Guerilla mulching, now that's an original idea - go for it!! Not a bad idea. I like the idea of re-purposing as long as it's not too tacky. [Read: petunias in the toilet set upon a dandelion-infested sprawl.] The only potential issue I can foresee in this setting is crowded roots. And, [dare I risk being a killjoy?] since hops are deciduous, there won't be a screen for half the year. Still, a cool idea. What were the chains hanging from - a beam attached to the building? Karen, what the heck is a hidey hole? The rolling carts the city supplies is are ridiculously huge. We can't even pull into our driveway on garbage night until we have them out on the street because they won't fit past our cars! Grace, Oh god! The petunia mental picture is a hideous one! As for the deciduous issue I can't imagine that too many people will be dinning outside on Burnside in the winter so they should be ok. As for the roots? Good point! how it grows, I think there was a actually a metal piece that came out from the building, maybe a sign once hung from it? I like it, seems like there have been more businesses gardening with vines lately, or else I am just paying more attention. The chains remind me, At the Safeway by my office, they have planted climbing hydrangeas next a wall, but they're trying to train them up chains. Curious. Not sure that's going to work exactly as planned. Grace is right, repurposing toilets is an unfortunate recycling effort. I have a neighbor with one of those. Ugh.